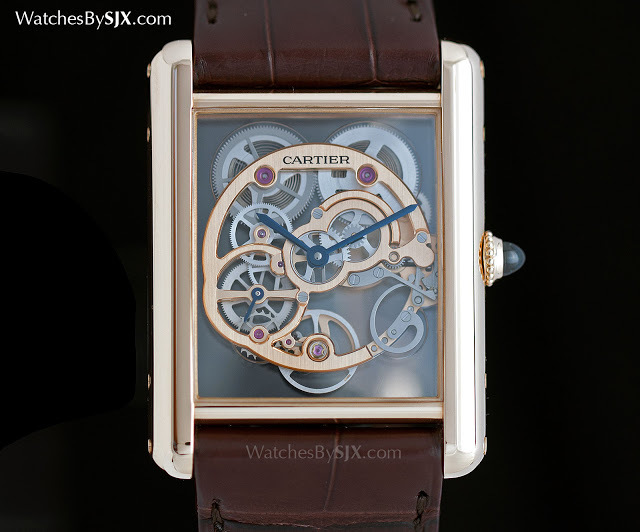 One of the hallmarks of Cartier’s Fine Watchmaking line is the diverse collection of skeleton watches, the latest of which is the Tank Louis Cartier Sapphire Skeleton in pink gold, with a movement suspended in clear sapphire. Originally introduced in white gold, the pink gold version of the Tank Louis Cartier Sapphire Skeleton made its debut at SIHH 2015. Less about complex mechanics than the visuals of the skeleton construction, the new Cartier Sapphire Skeleton has the same skeletonised movement with a sapphire crystal base plate, but combined with the warmer tone of pink gold. 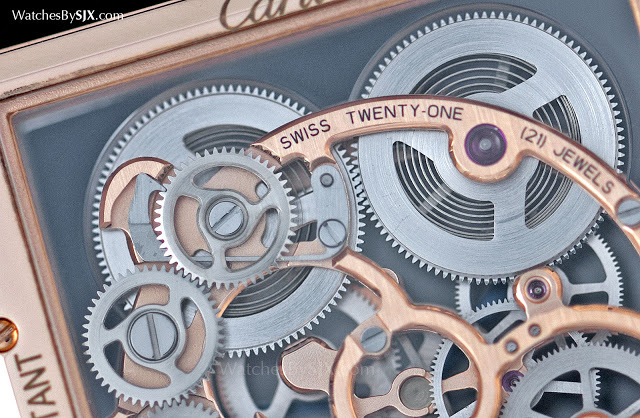 All the moving parts of the calibre – gears, springs and wheels – sit on a clear sapphire crystal base plate, seemingly suspended in the middle of the case. The bridges of the movement are permanently bound with epoxy to the sapphire plate, itself mounted on rubber cushions for shock resistance. With predominantly round forms in the movement, even the bridge is a large circular shape that runs from the crown to the balance wheel at six o’clock, the shape of the Tank case stands in contrast, but an agreeable one. On the reverse the round bridge shape is continued, almost in a mirror image of the front. 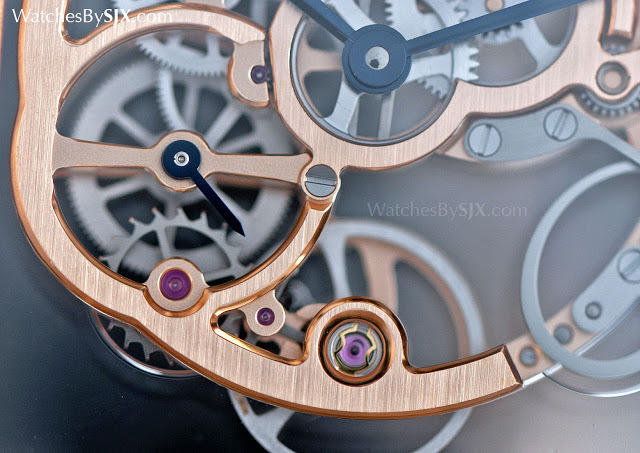 The 9616 MC movement uses the same underpinnings as the other Cartier skeleton movements, like those found in the Crash Skeleton or Tank MC Skeleton. 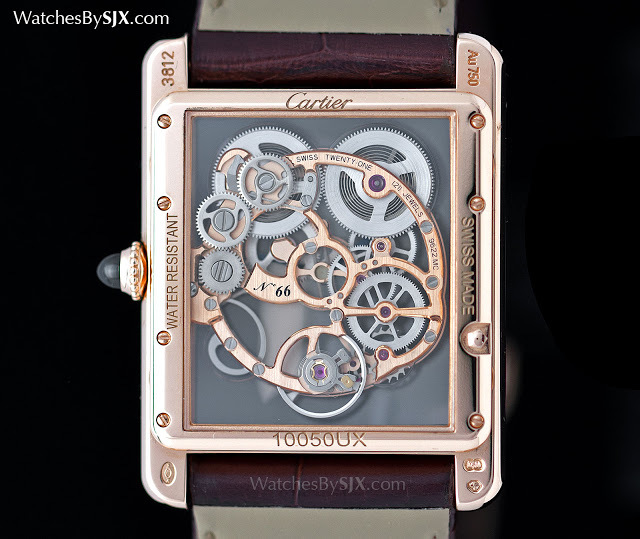 It’s hand-wound with a three day power reserve, thanks to double barrels, both visible on the top half of the movement. The pink gold case measures 30mm wide and 39.2mm long, making it suitable as a men’s dress watch or a ladies’ watch. It’s priced at US$47,800 or S$66,000. Cartier has now given its signature skeleton movement a striking new aesthetic with dark ruthenium bridges highlighted by gilded bevels, which will be presented for the first time in the Tank MC at SIHH 2014.